…that I can still be cleaning my kitchen three and a half hours later and not be what I consider close to half done? It’s not like it was that dirty to begin with. I just wanted to wash the coffee schmutz off the pot. Then I realized there was a spot on the counter top, so I moved the tins, which turned out to be empty, so I had to go to the cupboard for refills, but couldn’t find them right away, so I had to reorganize. I think I’m at the point where I can work my way backwards through the chain and get back to the coffee pot. Then I can work on the east side of the kitchen. I miss munenori. I want him to have fun at TOC, but I miss him. 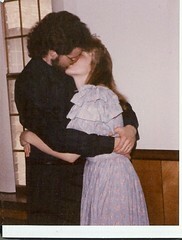 Another photo dug from the Walli archives, this time of our first kiss as a married couple. I love you, my darling husband. 19 years today and I still feel like a newlywed. Protected: What shall I do for Mr. Man? May 5, 2008 Enter your password to view comments. 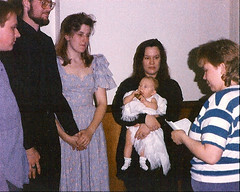 Eighteen years ago today, I eloped with my husband 22 days after our first date. I had proposed 10 days earlier. Sometimes you just know. I love you, honey. More than ever. You are currently browsing entries tagged with love at More Than Just the Food.